When cinematographer and editor Sam Davis received a call from producer Garrett Schiff asking him to recommend a woman director for a documentary about period shaming in India’s rural villages, Davis recommended his best friend and classmate from USC, Rayka Zehtabchi. Together they flew to India, returned to the states, launched a nonprofit called The Pad Project, began dating and released the short documentary, Period. End of Sentence (not specifically in that order). 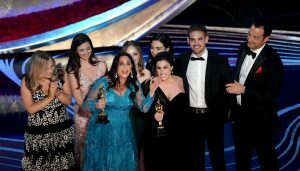 This past weekend, they stood on the Dolby stage together to accept the award for best documentary short at the 91st Academy Awards. 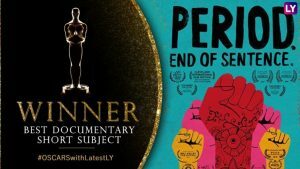 This year’s academy award winner for best short documentary went to this empowering film about women struggles in India and elsewhere. It brought tears to my eyes. Something so natural is shunned by societies and an embarrassment to talk about. One of the young women featured is studying to become a police officer, because then she can have her own voice, her own income and not be “married off” by her parents. When “quizzing men” about what menstruation was, it was evident where the “shame culture” comes from. Young girls hide their faces in their hands if asked about it. 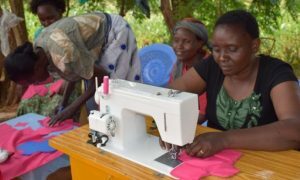 But because women are now finding employment in the villages, they are providing an income and gaining newly found respect. This is how the cultures are changing, by empowering women. The links here provide talks to the film makers about how they brought it to fruition and the Netflix preview for the documentary. It is worth watching and sharing and I hope you do both. Out of the endeavors of this came thepadproject.org. When a girl gets her period in the United States, she may miss a class. A period should end a sentence, not a girl’s education. But, unfortunately, that’s exactly what’s happening all over the world. Too many girls cannot afford or access sanitary pads, which means that when they get their period, they have to turn to unhealthy alternatives like dirty rags, leaves, or ashes. 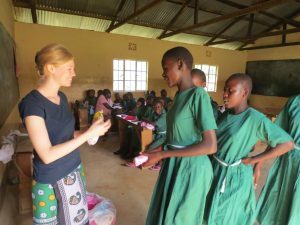 On top of their high risk of infection every time their period comes, they also have to miss school–and the more school they miss, the more likely it becomes that they will fall too far behind and have to drop out entirely. The good news is this project has spread across regions throughout India, Africa, Haiti, and everywhere girls need support, as funding has provided resources to help keep them supplied and work to help them thrive.